One of the temporary 3ft gauge lines was laid along the trackbed of the closed and lifted Cromford and High Peak Railway line. It appears to be a "cripples siding" for rolling stock awaiting repair. Temporary accommodation for the "Black Gang" of tradesmen and railway staff. In Summer 1932 this community totalled 107 adults and 25 children. North Western Road Car Co. Ltd. buses waiting to take workers to and from Stockport. Steam locomotive on the extensive, temporary 3ft gauge railway used in constructing the dam. Such railways were the usual means of moving materials in dam-building until the ascendancy of the internal combustion engine after the 2nd World War. 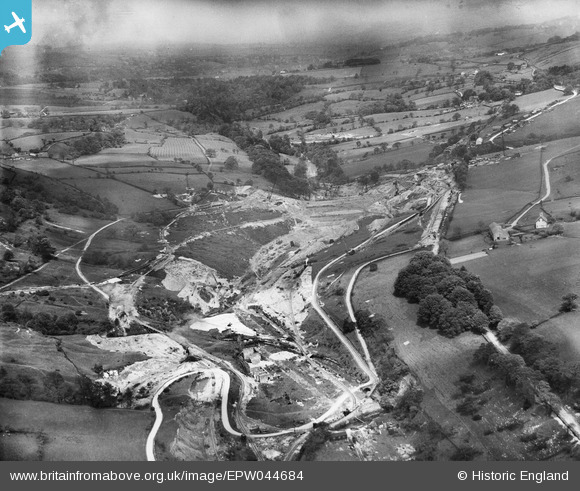 Course of the Cromford and High Peak Railway. The section from Shallcross Yard past Fernilee and south almost to Ladmanlow was closed in 1892 and lifted by 1894. Course of the Cromford and High Peak Railway shown by the one-time hedges which had grown to trees over the years. The section from Shallcross Yard past Fernilee and south almost to Ladmanlow was closed in 1892 and lifted by 1894.